I have a financial planner friend who often includes tax-free municipal bonds in his customers’ portfolios and therefore closely tracks matters like the Stockton bankruptcy’s potential impact on municipal bond rates. He definitely did not smile as he took the accompanying photo near his Newport Beach office. 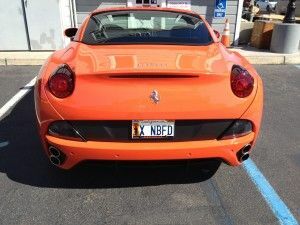 The license plate translates as “Ex Newport Beach Fire Department” and it’s affixed to a 2013 Ferrari California 30, a car that retails for $208,000 before all the costly extras and options Ferrari offers are added. It didn’t help that earlier in the week he saw another very expensive car — a Shelby Cobra 427 — with the license plate “I ♥ STERS,” as in CalSTERS, the California State Teachers’ Retirement System. And keeping up the car/pension theme, he knows a retired water district general manager who recently spent $200,000 on a professional rebuild of his late 1960s Oldsmobile 442. It’s possible these three well off former “public servants” could have lucrative side businesses, but more likely they’ve just got great retirement benefits. It’s common for a retired fire chief, for example, to receive a retirement pension of $200,000 a year or more, along with Cadillac (or Ferrari) medical coverage. To add salt to the taxpayer’s wound, Newport Beach currently pays 94 percent of fire employees’ pension costs, with the firefighters contributing just six percent. It’s actually considered a significant pension reform by some within government that the city’s contribution will drop to “only” 80 percent of the costs in 2014. Ferrari pensions — even Buick pensions — given away for just pennies on the dollar are proving to be unsustainable, as reflected by the recent announcement from CalPERS that it is going to hike employer contributions by 50 percent. Sure, they’re going to phase it in over six years, but a 50 percent hike is still a 50 percent hike. And when you multiply it by 1.6 million, the number of California government workers covered by CalPERS, you’re looking at some very serious financial impacts on municipal and state budgets. 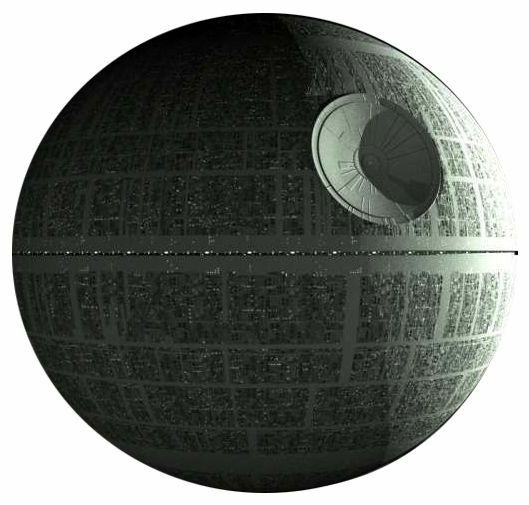 The rate increase was foretold by a recent California Public Policy Center report, covered in CalWatchdog.com as California’s pension Death Star, that predicted CalPERS’ pension costs would increase by 50 to 100 percent of the net property tax income of six Northern California counties it studied. To see how the new increase hits home, look at the small town of Canyon Lake in Riverside County. CalPERS already has increased the town’s contribution rate from 12.8 percent of an employee’s salary to 17.9 percent over the last three years, and the City Council was looking at its contribution going to 26.8 percent this summer — before the 50 percent rate hike starts to kick in. In response, the Canyon Lake city council did what any logical person would do: It voted to quit CalPERS. According to news reports, saying farewell is going to cost the tiny city $660,000, the amount of unfunded liability CalPERS is carrying on Canyon Lake’s small employee base. The city figures the cost of financing the $660,000 will be less than the cost of putting up with CalPERS jacking up rates instead of paring down benefits. Cities with more employees, especially those who have been shorting CalPERS because of their own financial woes, would be looking at much bigger settlements, should they decide to divorce CalPERS. They’re looking, nonetheless. San Jose recently found it would cost $5.7 million just to end CalPERS pensions for its city council; and Modesto determined it would have to pay $1.1 billion to fully exit the retirement system. I know of one special district that is developing a strategy for raising the money needed to divorce itself from the system without raising rates, and I’m sure the newest CalPERS rate hike will swell the numbers of municipalities looking at a CalPERS divorce. If American business ingenuity kicks in, as I suspect it will, you’ll see new financing tools to fund CalPERS split-ups. When that happens, the move toward more sustainable pensions could become a stampede, which would leave the nation’s biggest pension plan little more than a big chunk of space junk. In Crazifornia, my recent book, I predict it is likely California will only reform itself one catastrophe at a time. If so, we should hope the pension catastrophe will arrive before things get too much worse — and increasingly, it’s looking like it might. Laer Pearce, a 30-year veteran of California public affairs, is the author of Crazifornia: Tales from the Tarnished State. We are doooooooooooooooooooooooomed I tell ya! after cal pers folds up, what will they do with the 255 billion dollars they have in their fund? Maybe Sarah Palin will know what to do? I don’t see the economic significance here. Money is fungible, so with respect how badly the taxpayers will be soaked it’s irrelevant how it’s allocated between employee and employer. If the employee cut goes up, you can bet that future union contracts will cover it, so that’s no panacea. That would be government as usual, Bob, and California can no longer afford government as usual. The employees have to pay a higher employee share without a higher salary; otherwise we’ll see more municipal bankruptcies. I know the guy with the Ferrari, his family has owned realestate in Newport since he was a kid. He was one of the most wise money guys I ever met. His wife owns a home on an exclusive NB island, please do the math, he did not by the 200K Ferrari with his FD retirement. If your Financial planner friend cannot fiqure that out then you shouldn’t trust him with your money. The total amount of monies sent to PERS per employee is normaly 18% of their income. So when your talking about paying 90% it is 90% of 18%. Newport beach firefighters currently pay 9% of the 18%. The problem is that the FIRE industry (Financial, Insurance, Real Estate)the caused the worst financial collapse since the great depression killed the stock market and PERS returns. That caused PERS to increase the % needed from the municipalities. It is now at about 22% this year. For Seven years, thats right (7 years) the cities in CA did not have to send any mony, ZERO, because PERS was Super Funded (more money than they new what to do with)Stocktons financial planners spent that found money and didn’t save it for the day when rates would increase. Hmmmm, there are those pesky financial guys again. But overall, I agree with your implications,…up to a point. This article begins with sensationalized anecdotal evidence, like “every time I go to the grocery store, the woman ahead of me buys steak, lobster, and caviar, and carries it out to her new Eddie Bauer Navigator while talking on her Obama IPhone. And “CalPERS is going to hike employer contributions by 50 percent”? With the state, pension costs are less than two percent of the budget. So a fifty percent increase will amount to less than one percent, and that will likely be offset by other bargaining concessions. MOST state workers take home pay is less than it was in 2007. Many did receive a three to five percent increase in salary, PRECEDED by a three to five percent increase in employEE retirement deductions. Many employees are now enjoying the increased pension costs WITHOUT the concurrent “raise”. The fifty percent increase will hit cities and counties harder, because employee costs are a MUCH higher percentage of their budgets. However, even at that level, bargaining concessions will in many cases reduce the effects of the CalPERS increases. Today, for most miscellaneous state employees, that may be close…for the employers share. That would be in addition to the eight to ten percent paid by the employee. For safety and fire, the PERS costs are MUCH higher. Think thirty percent or more. However, keep in mind that government saves (usually) the 6.2% normally sent to Social Security, and, again, higher payments to PERS are often accompanied with other bargaining concessions. Note that the new changes in pension law caused some cities to fill empty positions before the change date in order to attract and retain qualified officers. VERY informative Doug and Glenn!